We are a growing business, how will wicketed bags be used in my bakery? What material should I choose for plastic bags to hold my homemade bread or rolls? Most of your clients use Polyethylene, which is a low density film. Also known as LDPE, should work well for your bakery goods. Polypropylene (CPP or BOPP) is another option. It is a higher clarity film and has a higher-end look. Let’s discuss your requirements. Call us at 877-768-6555. What makes Excellent Poly bags for the bakery goods different than other poly bags? I am not sure what to choose. Excellent Poly bags are custom designed and printed to make sure your get exactly what you need for your business. Additionally, we have the highest quality color matching machines so designs will match your logo and the colors you choose. You can have any color you want and print with up to 10 different colors. My logo includes 5 different colors. Can you design the bag with my logo and colors to look good with my bakery soft rolls? Can you print a border and design that looks appropriate for my rolls that take up approximately 8″x12″x3″ with color matching? Excellent Poly’s marketing department includes experts who will create a perfect presentation for your bake goods. Your plastic bakery bags can be virtually any size you need up to 59 inches wide. Read more about our printing capabilities. Our bakery logo sometimes includes an image of the outside of our business. Can that be included on the outside of our personalized bakery bag? Absolutely. We have photographic reproduction printing at Excellent Poly. We use the highest quality printing presses to give you the image you are looking for. Read more about our printing capabilities. Our business sells bakery goods as well as produce. Can I use one type of poly bag for both bread and produce? You can print a generic bag with a company name and use them for both products although the print details should be different. Most bakeries print the bread and rolls ingredients right on the bag. We may need to discuss this on the phone so that I can better understand your situation. Call us at 877-768-6555. Does Poly mean the same thing as plastic? Poly is a form of plastic – just another term. 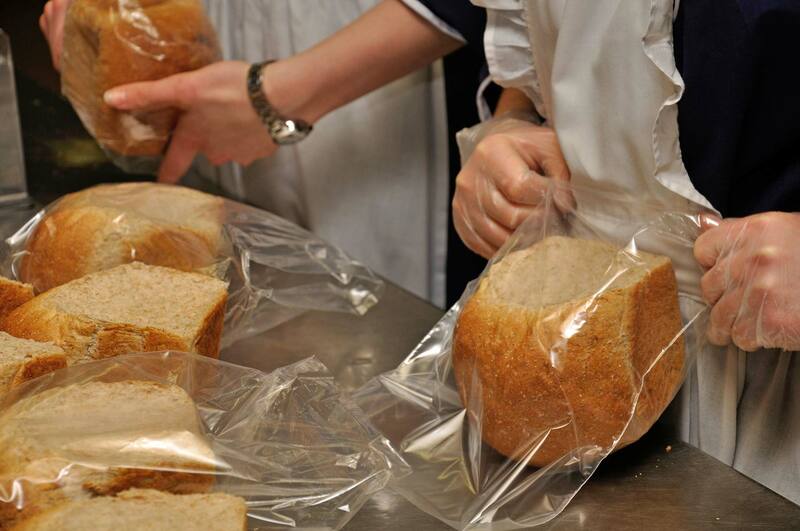 Learn more by reading our Bakery Poly Bags product page.